Ensure that your product is the best it can be with this 7 cut pie marker / cutter which makes sure that every piece is the perfect size. 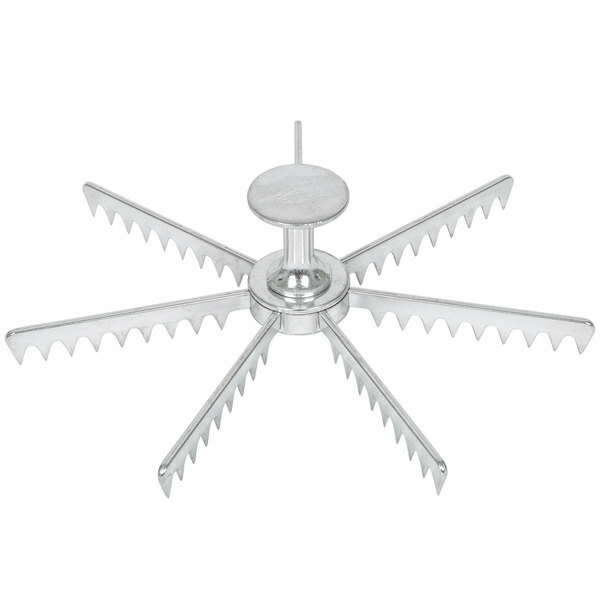 This can be used to mark top of cakes or pies before cutting for portion control or can even be used to cut soft pies or cheesecakes. The 7 cut pie marker is made of cast aluminum. 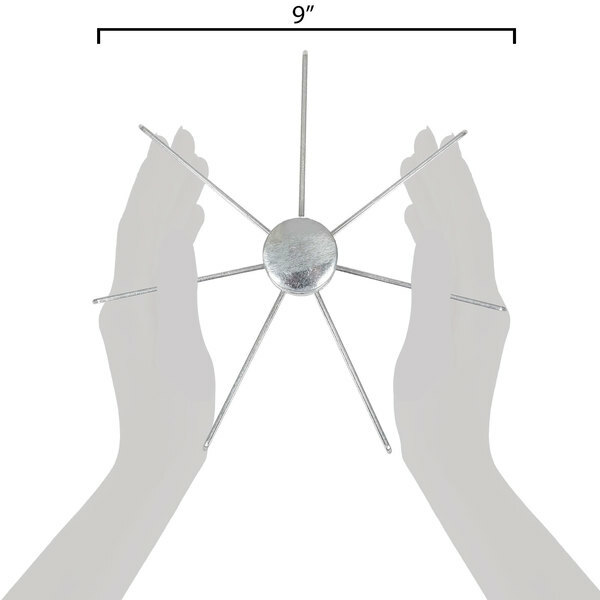 It features 7 arms with 9 teeth each, and a removable center knob. Lately I have found that the 7-slice size is very popular. This works well to either just mark where a pie needs to be cut, or to actually go ahead and cut the pie into slices. I was a little disappointed that this doesn't come packaged in a box, just bagged with a cardboard backing, but that doesn't affect the function at all. I LOVE this thing. How else am I every going to cut a pie into 7 pieces?! This works great! 8 pieces? Too small. 6 pieces? Too big. 7 pieces? PERFECT. I find this to be better as a marker for marking exactly where tocutnyiur pie. I don't like to use it as a cutter but as a marker you still get evenly sliced pie. This 7 slice pie market is great for marking pies. Wouldn't recommend it as much for cutting pies, especially with a crust top. Creampies would probably work better as far as the cutting aspect. Our pies have crust tops and trying to use this for fully cutting the pies seems to just crush the crust on top, but works great for marking! LOVE the practical use for this. Takes all the headache out of trying to figure the correct amount slices per cake. Makes your Job so easy. Making equal pie slices has been a task for me. This handy tool has helped me with keeping portion sizes equal and knowing how many slices each pie will yield. I ordered three of these leading up to an event where I needed individually sliced pieces of pie. They worked great, seem really solid and like they'll hold up for a long time to come. Cutting into seven slices by eye is nearly impossible, but used them with pies made in these #612PIE10DEEP and they were exactly the right size (six would have been too big, eight would have been too wimpy). This is one of those genius things that comes along and makes your life easier. Cutting a pie into consistently-sized slices is hard, and it becomes exponentially more difficult if you need an odd number of slices. This marks exactly where to cut your slices so they come out right every time. I'm more than pleased with it. This has made life so much simpler!! 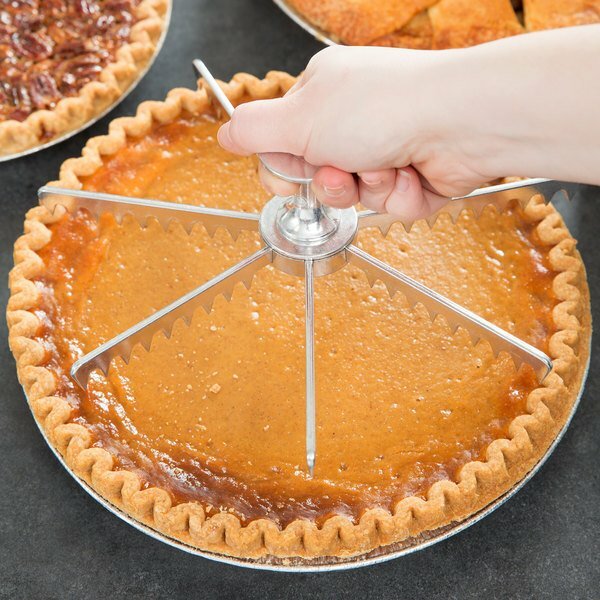 The 7 cut pie slicer is a great size for 9" pies. The 8 cut was too small so this is just right! 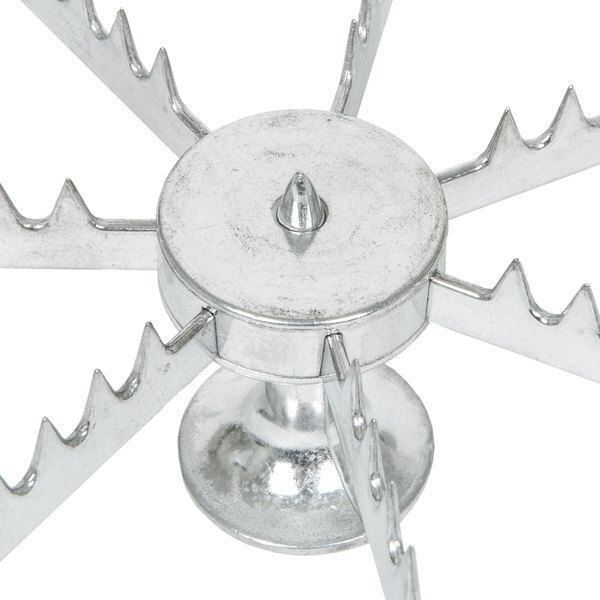 This cannot be used to cut pies bur only to mark them. I also noticed that not all of the sections are equal, defeating the purpose for the marker in the first place. Thank you for your review! We are sorry you were not happy with the pie marker you purchased. This item is mainly for marking where pies should be sliced. They can, however, be used to cut softer pies or even cheesecakes. These pie cutters are nice for marking my pies when I prepare them for baking to help my waitresses know where to cut uniform slices. The metal on them are slightly lightweight so I am waiting to see how they hold up. Good value for the price so far. These are great! I bought several different cutters for my pies and cheesecakes. They score the top evenly so that you know that each slice is going to be the same as the last. It took all the guess work out and made life a lot easier for me. I wish I had known about these ages ago! The handle comes off, making it easy to store. I had been finding it difficult to cut even pie pieces, with just a knife. This pie cutter marker works great. Thanks again, for having just what I needed. perfect size in place of the piece slightly larger or slightly smaller when you still need your pie "fix" - great idea! What a wonderful tool! Great product at a great price, Does its job very well, construction is not the sturdyist, but gets the job done, wish it was a little more heavy duty!!! It's really difficult to mark/cut anything into 7 slices - this marker makes it easy. The teeth help to cut into the scones so it's easy to finish slicing with a knife. This is a convenient marking device if you want to cut 7 even pieces to a pie (rather than 8) and get them pretty even.